Matala (Greek: Ματαλα) is one of the most popular towns not only of the southern coast but also of the whole of Crete. In the 1960s and 1970s, this small fishing village became a mecca for hippies. Its hallmark is a rock with cavernous caves, where the beach is located. For several years, Matala Beach Festival has been organized here, which attracts fans of good music and entertainment for one June weekend. Matala is located about 70 km southwest of Heraklion . Currently, it is one of the most recognizable places in Crete. On its eastern side is the Messara plain, which is one of the largest agricultural areas of Crete, and on the southern side the Asterousia range begins. The town itself is located at the bay of Messara, closed from the south and north. 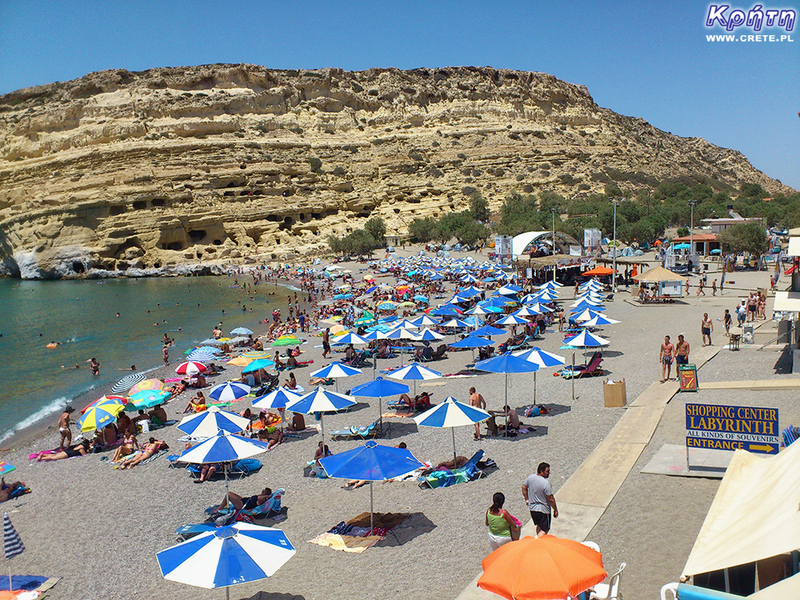 In addition to the picturesque location, an additional (45 m) advantage of Matala is a 300-meter beach. It is worth mentioning here, however, that there is no loose sand on it, but rather fine gravel. After all, for a Cretan standard, the beach is good anyway. Its northern part is covered by tamarisk trees, and the picturesque landscape is complemented by crystal clear water and the previously mentioned gently sloping rock with caves. The seabed is quite rocky in places, while the often-blowing western winds cause that there are high waves. Like the neighboring Kommos and Red Beach, this beach has been protected under the Natura 2000 program. Its aim is to preserve the local nature to ensure long-term survival of the most valuable and endangered species and habitats in Europe. The beach is equipped with typical infrastructure such as deck chairs with umbrellas, toilets, showers and water equipment rentals. It is worth noting that the safety of bathers is supervised by rescuers. In 2018, after a year's break, the beach was again awarded the Blue Flag award. In the evenings, both taverns at the beach and those in the interior of the town are full of people. In Matala you will find a lot of different private guest houses and a campsite. However, if you are going to be here on the Matala Beach Festival date , you must book places just after the date of the festival. As Greek zeus Zeus proclaims, who in the form of a snow-white bull kidnapped Europe, sailed with her to Matala. Here, too, according to Homer, a ship was to break down from Troi Menelaus, Helen's husband. In antiquity, Matala was the port of the nearby, second largest, Minoan palace in Phaistos . The ruins of residential homes from that time, as well as temples and dry docks are still visible at the bottom of the sea. Romans also took advantage of its convenient location. During their reign, Matala served as a commercial port for Gortyna , the then capital of Crete. The northern wall of the bay is made up of a steep rock consisting mainly of soft white limestone, in which numerous caves have been hollowed out. There is no certainty when exactly they arose, but some theories say that it could even be Neolithic. It is obvious, however, that both the Romans and the first Christians in these rock caves hid their dead. Some historians, however, note that in some of the caves you can see carved beds and windows, as well as porches. Therefore, they believe that some of the caves probably also served as homes. We also encountered information that there was also a leper colony there. At the end of the 1950s, Matala was a small fishing village consisting of about ten modest homes. They were built away from the sea shore in the depths of the ravine located on the extension of the bay. It was during this period that this place was discovered by the first rebels seeking freedom. For the most part, they were well-off people who could afford a carefree life in Matala. Among the regulars at the time, Matala even found a British lord. They took care of excellent relations with local residents. They never walked in too scant clothes, and women who were swimming in the sea used old-fashioned one-piece costumes. Times, however, changed and in the following years, the first foreign residents of Matala were here only during the holiday season and their place was taken by more liberated youth. In 1965, battles appeared here, representatives of the then popular nonconformist movement rejecting consumerism. In seeking the truth, alcohol and drugs were to help them. Two years later, this place was discovered by representatives of the hippie movement who settled in Matala for longer. They also protested against what they thought was meaningless with their lifestyle. Although the life they lead here can be described as quite simple and primitive, it is worth remembering that most of them were people with very good education. A large part of the hippies living here were then Americans who decided to live in unity with nature. They deliberately decided to give up life in a consumer society. Seeking the meaning of life and harmony, they spent lazy days and nights under the starry Cretan sky. A sense of freedom, a beautiful beach, hospitable bay and azure waters have created the perfect hippie scenery. In 1970, shots were even made here for the Greek film " My hippie aunt " directed by Alekos Sakellarios. Matala also attracted contemporary music stars with its climate of freedom. Joni Mitchell, inspired by this place, created the song Carey . Bob Dylan, Janis Joplin and Joan Baez also appeared here. However, one must imagine the cultural shock experienced by the native inhabitants of Matala who are observing new cave dwellers. In the sixties and seventies, Crete was inhabited by a very orthodox, traditionally living and god-fearing society. In those days, hardly anyone came to Crete, and mass tourism did not exist. Matala, on the other hand, was only a small fishing village located on the hard-to-reach south of the island. The long-haired incomplete hippies with their liberated lifestyle were too great a civilizational leap for the then Cretans. In addition, the atmosphere of freedom and love of flower-children was not supported by the dictatorship introduced by the black colonels in Crete at that time. The first person who opposed the presence of hippies in Matala was Michalis Vamvoukas, who started sending letters to the Cretan newspaper " PATRIS " with a request to remove them. According to Michalis, the lifestyle of hippies posed a threat to the local society and Orthodoxy practiced here. These letters initiated further events. The local bishop Timotheos (later archbishop of Crete) decided to drive wild natives out of the rock. He also wrote a magazine in which he called the caves "the home of a moral disintegration." These words hit the front pages of Athenian newspapers. The final solution to the problem of hippies in Matala occurred in the summer of 1969, when the Cretan newspaper " Mediterranean " described people who camped here as a "bummer". In the most delicate translation it can mean a menel or a tramp. There were also suspicions of homosexuality. After such publications, the prosecutor of Heraklion Michalis Tsevas commissioned a special investigation in the Matala caves. The purpose of the police raids lasting day and night was to search for the famous orgies. And although no evidence of such sexual orgies or spreading homosexuality has been found, cannabis was discovered during police checks. Ultimately, therefore, the investigation ended with seventeen convictions for possession of drugs. The actions of the authorities and the church led to the fact that the community of flowering children left this place and moved to other parts of the island. They found shelter near the beaches of Vai , Plakias , Preveli or Lentas , as well as on other Greek islands. The archaeologists took over the caves and closed them for a long time. Today Matala caves are not inhabited. Only a few years ago access to them was free. Currently, access to them is protected by a fence, caving in caves is forbidden. The archaeological services are taking care of this area. Tourists can visit them, but admission is paid (3 €). According to residents of Matala, there are still a few hippies in the caves in the surrounding mountains, continuing the bohemian life. We saw such inhabited caves from the trail to the nearby Red Beach. Few hippies are reportedly living on the Dytiko beach near Lentas . The present Matala no longer resembles a poor fishing settlement. The whole region, just like Crete, underwent rapid modernization, and small coastal towns were transformed into tourist resorts adapting to the needs of today's tourists. Matala's colorful past is only reminiscent of the famous inscription on the beach: Today is life, tomorrow never comes and souvenirs related to the hippie movement sold in shops. The old climate also comes alive during the Matala Beach Festival. In 1996, Elzo Smid from the Netherlands became interested in the history of the caves in Matala, one of the ordinary tourists coming here. After spending only a few hours at this place, he was intrigued by the hippie episode so much that he tried to learn more from local residents. Unfortunately, his efforts failed. Cretans avoided talks about long-haired residents staying here before and did not want to give him any information. After returning home for many years, he tried to drill down on this subject, he searched for information on the Internet, but the Internet at that time did not bring him any answers. The situation changed when he accidentally received the archival issues of Life magazine, among which he was the one with a reportage on Matala. He posted the scanned article on his website, asking for contact with old hippies living in caves. In 2010, the writer Arn'e Strohmeijer, who also collected such relations, contacted him. Strohmeijer, sent to Elzo stories, completed his collected material. On the basis of these accounts, he wrote the book " The Myth of Matala ", and the memories of the inhabitants of the caves in Matala illustrated about a hundred original photographs received from ancient rebels. The premiere of this book took place in 2011, and Arn Strohmeijer with the publisher decided that the only place where she could have had her presentation was of course the beach in Matala. When the old "veterans" from Matala learned about these plans, they suggested organizing concerts in the shadow of the legendary caves. Of course, they were to refer to the nostalgic 60's and 70's. It was supposed to be a way to attract those who lived here or identified with the hippie movement to Matala. Of course, the event was also intended for contemporary tourists and music lovers. As it turned out, it was a literal hit, because the slogan of returning to the past hit a fertile ground. About 35,000 people downloaded for the first event, and almost two times more for the next event. It soon turned out that this 3-day event has the magical power to attract more and more fans of good music and fun. So they started organizing them every year on one of the weekends of June. In 2018 Matala Beach Festival will be organized for the eighth time. Of course, Elzo Smid, from the curiosity he began, also arrives at this festival. Certainly this event is one of a kind and carries a huge amount of climate of old hippies. This unique atmosphere means that every year a lot of people come here who want to live music for 3 days and enjoy the beautiful weather. During this time, Matala turns into a tent town, and local authorities organize buses that travel specifically to this place. The streets of Matala are covered with colorful and fanciful paintings created as part of the Street Painting event in which everyone can take part. This year, however, a significant change is being prepared relative to previous editions of the festival. From 2018, admission to the festival will be payable. Admittedly, the cost of entry is not particularly high, as it amounts to only € 5, however, this solution raises quite mixed reactions in local media, according to which the introduction of such a fee in some way contradicts the openness of this event. Many people choose Matala for their holiday destination not only because of its picturesque location. It is also a good base for exploring this part of Crete. In addition, Matala, despite its relatively strong development, is not yet reminiscent of the tourist towns of the northern coast of the island dominated by aggressive organized tourism. There are no All Inclusive hotels where travel agents send their clients. This means that in the Matala season, in the evenings, he lives a full life, and in taverns it is difficult to find free tables. 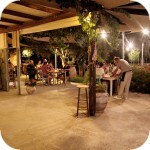 It is a peaceful place, and people spend their evenings in taverns eating Cretan delicacies washed down with local wine. So if you plan to explore this area of ​​Crete and at the same time do not look for an extremely quiet and isolated place, you can choose Matala for the holidays. Of course, there is one more condition. Holidays in this place you have to organize yourself, because as far as we know at the moment, no Polish travel agency sends its clients here. Not far from Matala, there are two of the most important archaeological sites of Crete. We mean the palace in Phaistos and Gortyna . Smaller excavations can also be seen in Agia Triada . Also, enthusiasts of active recreation will be able to take a walk along the Agiofarago gorge. On the occasion of this trip, it is worth getting to the Odigitrias monastery located on the way. Many hiking trails offer the Asterious mountain range nearby. It is much less popular and little known, so these mountains can appeal to those who do not like crowding on the trails. If you fancy a more exhausting trip, it is worth going north to the Agios Nikolaos gorge (Zaros, Rouvas) , or try to get the highest peak of Crete - Psiloritis . The Idajskie Mountains, the Nida Plateau and the Nida cave are within the reach of motorized tourists. In addition, it is worth pointing west, where attractive places are located, eg Triopetra , Agios Pavlos or Agiofarago beach (not to be confused with the beach at the end of the same-named gorge - these are completely different places). If someone longs for the atmosphere of a large city, it is also relatively close to Heraklion or Rethymno . In addition to active sightseeing, you can simply lie on the beach, snorkel and dive in the ruins of the sunken city. 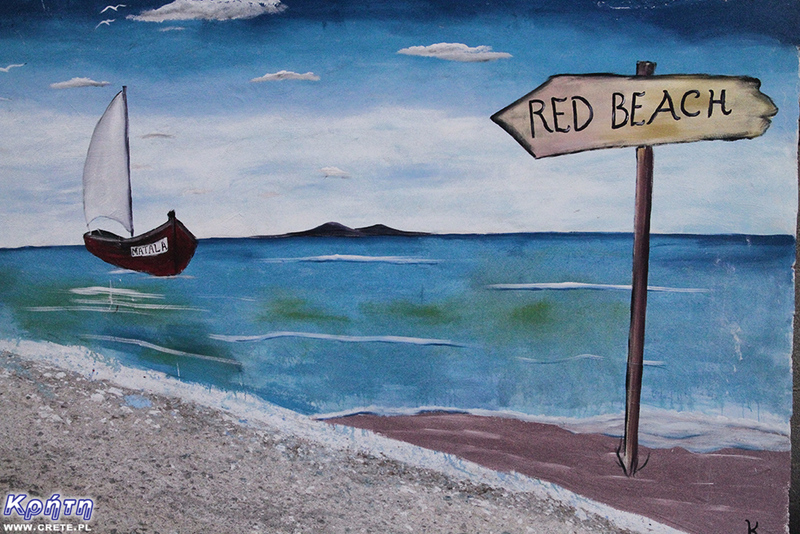 Within a short walk there is also a Red Beach known among naturists, meaning Kokkini Ammos. Sunrise and sunsets change the color of her sand to reddish. In addition, nearby rocks also cross short hiking trails, so it is worth testing them. On the other side of the famous rock with caves is the small town of Kommos, where one of the longest Cretan beaches begins. It is here, at the end of May, that Caretta caretta turtles set up their nests.